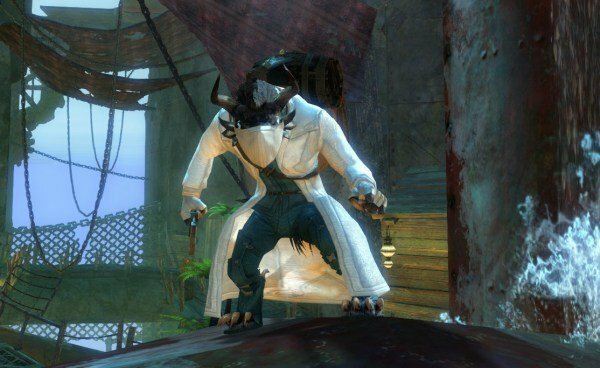 [Guild Wars 2] Kahlef dressed as the Mad Charr Doctor! Previous article:[Guild Wars 2] The big ding! That is just too awesome for words! Celestial and Country Teal dyes? And I am amazed that you can recognize the colors just by looking at them. Me? I have to look at the color names in the dying window. Oh, by the way, I got a pointy wizard hat from the "Mad King Says" event in Lion's Arch. Now I just need to find town cloth that looks like robes and I can have my charr gandalf! Although I might just go for it next year since Halloween is over already. I can't believe I hadn't commented on this yet. I LOVE it. And I /bow to your screenshot skills; that's perfect. This is great! (sorry I'm late on commenting) It's yet another reason for Cel to avoid that city like the plague...creepy hiding doctor!!! Eeek! Thanks! And if it makes you feel better about the Black Citadel then don't worry about the doctor. He doesn't exist (yet!). It is just something I made up because I couldn't come up with a better costume for this challenge. Next year though I might have something that feels more like an actual costume!